It seemed only fitting that today, as party of #marriedmay (a lovely hashtag created by Phoebe over at So You're Getting Married) I share an update on our flowers. 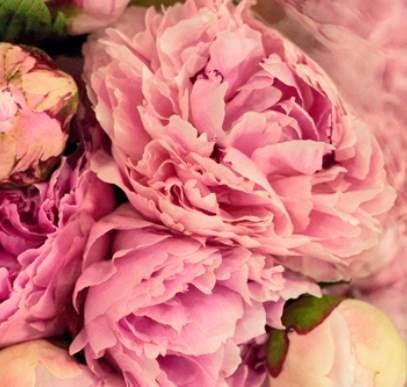 I share my favourite flower with Blair Waldorf - Peonies. A few months back, I wrote a post about my struggle with all things floral for our wedding. Thankfully my mother-in-law to be, Marie came to our rescue. She recommended a fantastic florist and friend Sharon at Occasions Floral Design, who we met with at the start of March. Sharon listened to our ideas for the wedding and was happy to make suggestions but ultimate take our lead on the flowers. I'd drawn some sketches of what I'd like the arrangements to look like, not the easiest way to select flowers for your wedding!! As we really wanted to do the flowers ourselves, but we were going to struggle with executing this successful, so she agreed help us by doing as much or as little as we wanted. We decided that Sharon (and Joan) would create some hand tied bouquets for Fiona, Jenny and I. These bouquets will be photographed a lot and we wanted them to look beautiful for the whole day. They are also going to provide flowers for us to arrange on the tables. They've been a fantastic help at guiding my quantities and suggesting the best flowers to create the soft natural, hand picked looks we wanted. They are going to prep and condition the flowers for us and deliver them to the venue where we will still have the opportunity to arrange for the tables. I can't wait to see the final arrangements! 2 Weeks Married - Thank You!